This Mini egg fudge is both awesome and ridiculously easy to make. 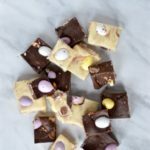 It’s also a great basic recipe for any fudge you want to make – laded with Mini eggs or otherwise. You can also make it on the hob or in the microwave, take your pick. Start with some therapy – bash two-thirds of the Mini eggs so that there is a variety of pieces of different sizes. Also line a high-sided baking tray (roughly 30×20 cm) with greaseproof paper. If you’re making two flavours, make a divider out of tinfoil and place it halfway down the tray. Put a pyrex bowl over a pan of simmering water and add the dark chocolate to it. Let it slowly melt over the heat. Once melted, take it off the pan and add in the orange extract and half of the condensed milk, then mix with a spatula. Add in half of the crushed Mini eggs and fold them in. Pour into one half of the baking tray. In a clean bowl, add the white chocolate and melt over the pan. Once the chocolate is melted, take it off the heat and mix in the vanilla extract and remaining condensed milk. Fold in the rest of the crushed Mini eggs and decant into the tray. Take your remaining whole Mini eggs and press them into the top of the fudge. Set overnight in the fridge and then slice into squares. Put the dark chocolate in a bowl and melt carefully in the microwave – don’t let it go for longer than 10 seconds without checking it, chocolate burns easily. Once the chocolate is melted, add in the orange extact and half of the condensed milk and mix. Fold in half of the crushed Mini eggs and pour into one side of the tray. Repeat with the white chocolate. Melt and then mix in the vanilla extract and remaining condensed milk. Fold in the rest of the crushed Mini eggs. Press the whole Mini eggs into the top and set overnight.